"Design For Nature In Dementia Care"
- Review by Les Morgan, Growth House Inc.
Garuth Chalfont was interviewed by Peter Wißmann at Demenz Stuttgart Support in November, 2009 on the topic of enjoyment of nature for people with dementia. The interview appears in the April 2010 issue of "Demenz das Magazin" and is entitled "Nature is Life!". 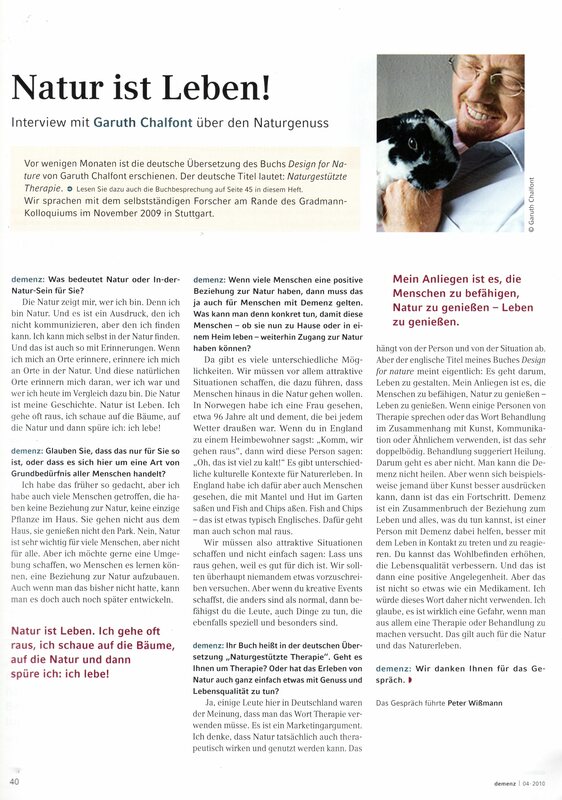 The interview was on the occasion of the publication of his book entitled Naturgestützte Therapie, which is the German version of Design for Nature in Dementia Care and is published by Verlag Hans Huber in 2009. A growing body of research demonstrates what can be positively provided to promote the quality of life and quality of care for people living with dementia. This is increasingly important in the context of personalisation and the governments’ current transformational agenda. This book offers an important contribution to excellence in research and education and is published by the Bradford Dementia Group. Dementia continues to be a much stigmatised condition within our society and this book challenges traditional views about what can be achieved to meet the needs of each individual in a carefully considered and personalised way. It is the culmination of extensive ethnographic and anthropological research undertaken by the author over a number of years. Chalfont akes a holistic approach in exploring how one might use spaces and nature in order to exploit the relationships between people with dementia and their environments. He encourages readers to use their imaginations and willingness to break with traditional approaches to care practice by making connections between the personal history of the individual concerned, their culture and the vital importance of providing emotional and sensory stimulation through nature. This results in a detailed examination of the therapeutic benefits of providing a range of opportunities for the person with dementia to engage with nature and the natural environment. The book is presented in two parts; nature indoors and nature outdoors. Part one has three chapters devoted to issues around what it means to engage with nature and promoting nature-based activities providing numerous examples of what can be done to encourage interaction with nature indoors. Part two comprises of four chapters focussing on outdoor activities. It considers the individual’s potential to increase their experiences of pleasure, enjoyment and well being through encouraging both visual and physical contact with gardens, plants and animals. All of these are explored as vehicles for social interaction, reflection and reminiscence supported by case studies from Chalfont’s own research. Each chapter summarises key points from three different perspectives; the person with dementia; the social environment and the physical environment. It is grounded in realism with plenty of practical tips. Chalfont does not skirt around ethical issues such as safety and risk which when not properly considered can stifle innovations within institutionalised care practice. Readers are helped to understand connections between dementia research and environmental design. This is unfamiliar territory for social workers. There are powerful messages within the book about the subtle protection and hiding away of people living with dementia from their natural communities. I found the discussion on the importance of walking and exercise as a basic human right particularly revealing. Illustrated with line drawings and boxed research summaries, the simplicity of this book belies its important messages “and therein lies the potential for beauty” (p. 155). I wholeheartedly recommend this text to tutors and students who are exploring the impact of dementia in their interactions with service users and their networks. It would be good on a reading list for pre-qualifying students in practice learning settings with older people, either in assessment or provider services, particularly in dementia care. Some of the concepts described above could be used as stimulus material in seminar groups. I will suggest this as additional reading for students following any modules on adult social work who are working in older people’s mental health, and particularly for those following Post Qualifying awards, as it would stretch practitioners’ knowledge and creativity. Garuth Chalfont brings an obvious passion and enthusiasm to the subject of design. It is clear from the outset that Chalfont believes in the therapeutic benefits of designing for nature and its positive use for people with dementia. The book is laid out in a simple, easy read format and the language is such that the book is accessible to a wide range of readers. Each chapter covers a topic in depth and gives a wealth of research based evidence which can be used as a guide to further reading. There are sections about implementation of the chapter topics, which look at the person with dementia, the social environment and the physical environment. Supporting theories and the research base for the benefits of the multitude of aspects discussed in the main text are provided in clearly defined boxes.This allows the reader to complete a section uninterrupted by references and quotes and then return, should they wish, to the theory or supporting evidence. I found this a fascinating book. The practical ideas for bringing nature into the daily lives of people with dementia and re-establishing this all-to-often broken connection were simple and easy to implement. Who cannot find time to bring pot plants into the environment or help people go for a walk in the fresh air? The book also gives more complex suggestions, for example the use of webcams as a window on the world. I would recommend this book not only to those interested in design for people with dementia but also to those who live and work with people with dementia. It is a thought-provoking read and will help people to think about the importance of the natural world not only to people with dementia but to themselves as well. The book describes a wide range of ways in which persons with dementia can be enabled to positively and more safely experience nature in their day-to-day life, both through indoor and outdoor activities and through better design of the environment. Overall, this is an extremely practical book probably aimed at care staff and families. The book is organized into two parts. The first part of the book, which is a very short 41 pages, looks at nature indoors and has three chapters. In part 2, there are four chapters that consider the outdoors. The text is concise and clear and is interspersed with vignettes and bullet pointed lists of hints and tips. The wide range of examples offered in the chapters means that there are ideas that would probably suit persons with dementia and most levels of abilities. Running through the chapters are boxes that set out some of the evidence for what is being suggested. This is a nice idea and in keeping with the style of book, although some practitioners may feel they lack depth. Both sections have a chapter on some of the ethical issues that families and staff might raise in relation to the activities described in the book. Whilst this might be enough for some, I found I wanted to see more being offered to help teams or families work through issues, where there were differences of opinion. Overall, a nice resource for teams interested in developing this aspect of their practice. This is a valuable and informative reference book for anyone wanting to improve the physical environments of people with dementia. Garuth Chalfont, a design consultant and researcher at the University of Sheffield’s School of Architecture, successfully brings the ‘voices’ of people with dementia squarely into the design brief. The ‘nature indoors’ section looks at houseplants, cut flowers, pets and nature-based activities, including therapies, horticulture, handicrafts and cookery. It raises issues particular to people with dementia that are often overlooked, including ethical considerations. The second part, ‘nature outdoors’, considers opportunities to enhance a person’s connection to nature through good building design. It focuses on light, views, window height, furniture placement, ground-level entrances, balconies and outside activities. This would be useful for users, designers and carers concerned with the everyday activities in which people with dementia might be involved. Chalfont’s depth of knowledge and passion for the subject are evident throughout. Target Audience: Primarily aimed at care homes, but is addressed in a way that makes this practice guidance widely applicable. Parts of this book would provide a useful resource for carers and professionals (i.e. OT’s) working with individuals with dementia in the community. Aims of the Text: This book aims to encourage the development of a person centred approach in the design of living environments for individuals with dementia. Chalfont’s hopes from this text are: “…to bring the voices of people with dementia squarely into the design brief…” This text aims to provide evidence of the beneficial effects of nature. Chalfont believes that “the goal of design is not to simply fill up a person’s day”, but that being armed with basic tools and information, people involved in development can build environments that “enrich lives”. Content of book: The text is divided into 2 parts: ‘Nature Indoors’ & ‘Nature Outdoors’. As the setting is largely residential care, each chapter discusses how nature may be used in a residential home; it has a section outlining the research evidence and ends with a list of suggestions for implementation, from the perspectives of a person with dementia, in social and physical environments. There is a useful list of appendices e.g. checklist designed as a tool to be used when designing the environment. Author’s background: Garuth Chalfont has had a series of career transitions including therapeutic landscape and architecture. He is a researcher on the ‘INDEPENDENT (Investigating Enabling Environments for People with Dementia) project’ from which he was able to complete his doctoral thesis, which informs many sections of the book. Applicability to Occupational Therapy: Although the target audience for this book would primarily be care givers and managers within a care setting, it is also a useful resource for OT’s working in dementia care, but particularly a continuing care unit, an in-patient unit, or a day hospital. The research cited at the end of each chapter is useful as evidence on which to base practice. Readability: This is a very practical book, and laid out in such a way that the reader can just ‘dip in & out it’. It is written in very clear, plain English. Ethical issues are raised and addressed in a very user friendly way. Are the aims of the book met? Chalfont leads the reader clearly through every stage and possible scenario when considering the environmental design of a person with dementia’s living space. He has spoken with care providers, care givers (both formal & informal) and most importantly the person with dementia to gain fresh and important insights into this topic. Recommendation: This is a ‘must have text’ for any setting that provides care for a person with dementia. It would be a useful addition to an OT library in such settings. This book is a welcome surprise addition to the literature on person-centred care in dementia practice, and is an excellent example of the positive involvement that professionals other than health and social care can have. It draws not only on activities but also environmental design, including excellent section on indoor and outdoor activities, as well as ethical issues. Arguments are research-based, and the book has the potential to be used for evidence-based or rationale practice at a professional level. Cleverly, research examples in text boxes are punctuated throughout the book, allowing the reader to skip over or dip into each section as desired. Although chiefly about design, relating the activities mentioned to differing levels of cognition might have made the book more accessible for frontline staff in their day-to-day work. Perhaps, too, the book may have also benefited from a section on ‘old favourites’, plants and flowers grown and enjoyed specifically by previous generations. However, the appendices were an excellent touch, and included lists of ‘edible plants’ and ‘poisonous plants’ for those wanting this level of detail. Particularly noteworthy is the author’s view that the potential for connecting with people who have dementia in care environments is limited only by our imagination and our willingness and resolve to design nature into life. Indeed, too often we see social, health, and allied health professionals becoming the hub of multi-professional work – and we often fail, through our own occupational prejudice, to recognise the contributions made by others. The author of this book has not only shown the importance of ‘design for nature’ in dementia care, but also taps into our own understanding and values in emphasising the need for occupational diversity and inclusion when realising true person-centred care.